Sorry for the inconvenience, I've been spending all spare time playing Grand Theft Auto IV. Regular broadcasting should resume soon. 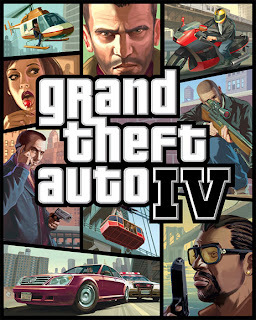 I am pretty sure that this game is not going make me run down pedestrians, jack cars, pick up hookers, or any other criminal activity portrayed in the game. That said, if I had a child of gaming age, they would not be playing this game... But that isn't who it is made for. This is definitely an adult game. Many people don't realize that gaming isn't just for the thirteen year old kid like it was when I was a ute. Kids on the bleeding edge of computer/console gaming (pong, space invaders, etc) are now in their thirties and forties. Technology has made it possible to make games deep enough to keep the attention of an adult. This game is a the pinnacle of that right now. It has a huge city where each block has it's own identity. There are seemingly hundreds of different pedestrians throughout, each with a different personality. You steal a car from one person and they run screaming, you steal another and if you don't take off quick the guy yanks you out and fights you. Then there are the missions. They aren't laid out in you typical linear fashion. Do mission A, then B, then C, etc. This is sandbox style. You start with A, maybe do C, jump to E, then B... You still have to complete some before you get to others, but it makes you feel that you are calling the shots. It is like a chose your own adventure book, but in moving cartoon form. They do a good job developing the characters. You feel for the main guy Niko. He's isn't a heartless shell. Past GTA's while really good, didn't hook me like this one has. I'll be sad when I have to part ways with him. So far I have to say that this is my favorite game yet, and I am not even half way through. (I won't tell you how many hours I have into it...) It seems to get better ever new stone tha tI flip while playing. Hopefully I'll have it complete in a week or two. then I may just play again and make some different choices and see where those take me.